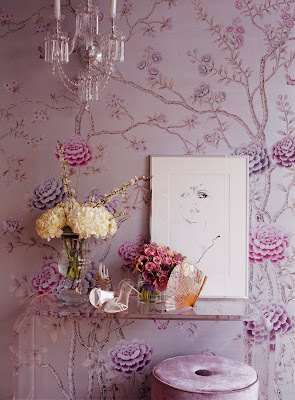 I came across this picture on House Beautiful magazine featuring an exquisite hand painted wallcovering, while searching for inspiration for a new project. 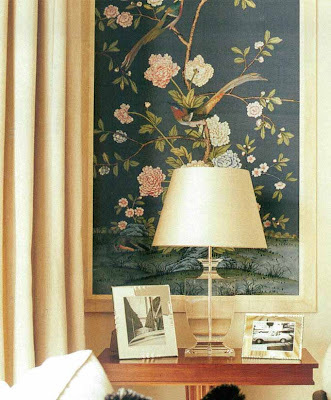 Doing some research, I found out about De Gournay, a brand that specializes in reproductions of historic prints, particularly 18th century Chinoiserie and 19th century French designs. 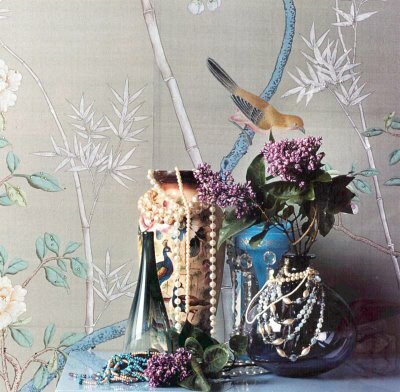 Even if you don't know the name, chances are you'll have at some point seen De Gournay's fabulous wallpapers. Most probably a spread on a fabulous interior design magazine or in some glossy fashion shoot or perhaps on the cover of 'Domino, the book of decorating'. Their wallpapers are a true luxury, hand painted by artisans, most of them are customized to clients' specifications. An impressive range of materials is available: silk, India tea paper or Xuan rice paper, to name just a few. The wallpaper is first treated with traditional pork bone glue, as it was some 300 years ago, before spending around five weeks dyeing or gilding with shimmering 22carat gold leaf, depending on clients' choice. I am specially fond of the monochromatic custom made color schemes. I am sure you'll agree the results are nothing short of spectacular.